Battery-powered forklifts—ranging from small pallet forklifts to high-lift trucks—have become increasingly common as technology has advanced. Batteries now run longer, can be recharged more quickly, and produce less emissions. 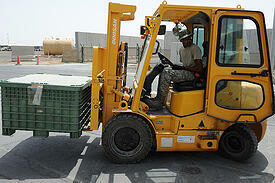 However, both types of batteries commonly used in forklifts—lead acid and nickel-iron— pose serious hazards. To safely charge and change batteries in forklifts, you must systematically guard against those hazards through proper training, the use of personal protective equipment (PPE), and sound procedural policies supported by safety checklists used during the process. Batteries used in forklifts are heavy—some weighing more than a ton. Inside the batteries are corrosive chemicals, and as they’re being charged, they can release volatile gases. To protect against drops and contact with harmful chemicals or gases, PPE must be used. Safety footwear (e.g., steel-toed boots) should be worn to prevent injuries from dropped batteries. Chemical-resistant gloves, acid aprons, safety goggles, and face protection are essential to protect against acid splashes when adding sulfuric acid to batteries to charge them. Battery removal, charging, and replacement should occur in an area set aside for that purpose. Because batteries release oxygen and hydrogen gases when they are charging, the areas should be well-ventilated with a fume hood or an exhaust fan to prevent explosions due to build-up of those gases. Because they are so heavy, batteries should only be removed and replaced using a forklift or battery cart specifically designed for transporting batteries. Using the proper tools and procedures, personnel can ensure the battery is stable during movement and doesn’t fall. To put batteries in place for charging, a conveyor belt, overhead hoist, or other suitable material-handling equipment should be used. If batteries are charged in the forklift, the trucks must be properly positioned and securely braked (in a properly ventilated area!). The battery vent caps should be inspected to make sure they’re working, and the battery cover should be open to allow heat to escape. A fundamental rule of thumb is that acid should be poured into water, but water should never be poured into acid. An eye/face wash shower should be installed and be reachable in 10 seconds or less from the charging/changing station. For handling electrolytes, provide a carboy tilter or siphon. Smoking should be completely forbidden in the charging area. Open flames, sparks, or electric arcs should be avoided in the charging area. Anything metallic (e.g., tools) must be kept away from the top of uncovered batteries. Moisture on top of the battery can lead to corrosion and cause the battery to become electrically conductive; it is a sign of a problem (overfilling, excessive out-gassing, or leaky seals) that needs to be corrected immediately. Have neutralizing agents on hand at all times in case of an acid spill. With so many potential safety hazards involved, it’s impractical to expect personnel to adhere to all safety procedures without a checklist to guide them. At the Checker, we have such a checklist, which has been proven to help companies keep their battery charging stations safe. Whether you use The Checker or another checklist, you need to be using something. Handling and charging forklift batteries is a dangerous activity—there’s no room for complacency, and the potential for human error must be minimized. Checklists that personnel must complete are the best way to ensure that critical safety steps aren’t overlooked. Battery-charged forklifts offer many advantages, but steps must be taken to ensure safety while servicing them, such as using PPE, ensuring the charging station is suitably set up, and using checklists. Image courtesy of U.S. Air Force, Master Sgt. Scott MacKay, via Wikimedia Commons.